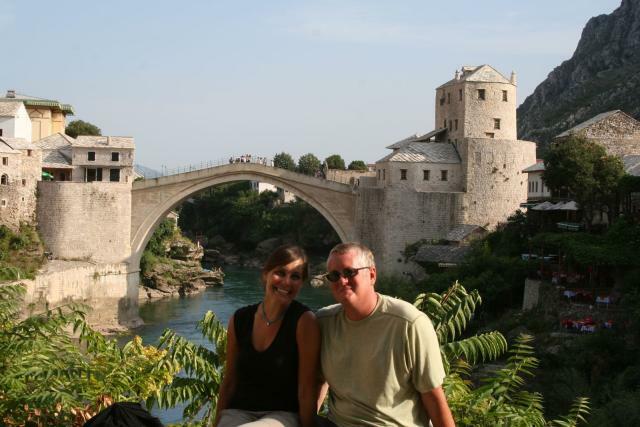 Considering that Bosnia is most recently known for a gruesome war that ended just 13 years ago, I’m guessing that there aren’t many people out there who put Bosnia and Hercegovina (aka “Bosnia”) at the top of their list of vacation destinations. In fact, it wasn’t on our radar screen until we looked at a map and realized that driving through Bosnia (and then Serbia) on our way from Croatia to Romania would save us at least a day of driving. Of course, there was one catch – the terms of our car lease didn’t allow us to drive through Bosnia or Serbia because our car wasn’t insured there. After discussing the risks of driving through war-torn countries without insurance for approximately 14 seconds, we hopped in the car and headed to the border. Following the lead of Slovenia and Croatia, Bosnia declared independence from Yugoslavia in 1991. 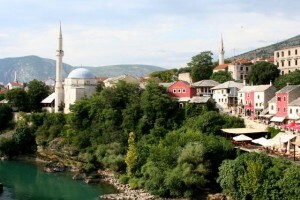 Unlike Slovenia (composed mostly of Slovenes) and Croatia (predominately Croats), Bosnia had a fairly mixed population of Croats (who are Roman Catholic), Serbs (who are Eastern Orthodox Christian) and Bosniak Muslims. 1 Accordingly, the declaration of independence from Serb-dominated Yugoslavia was not universally accepted in Bosnia; in fact, the Bosnian Serbs living in the country immediately declared their own independence from Bosnia. 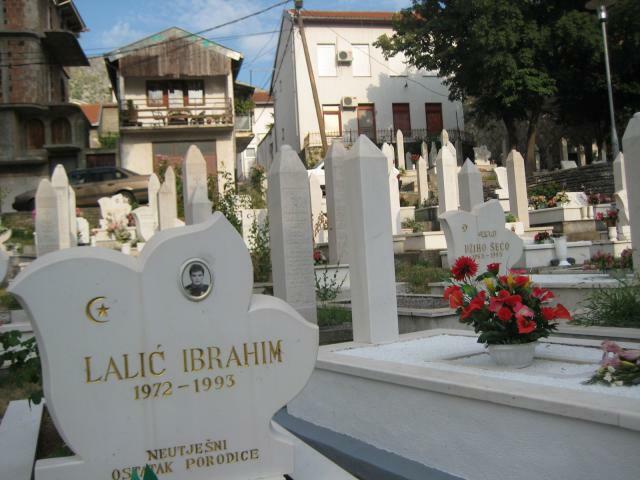 The next four years were filled with massive bloodshed, with the Serbs and the Croats (who initially were on the side of the Bosniak Muslims) effectively trying to exterminate the Muslims from the country. Evidence of their attempted genocide is still everywhere. After arriving in the city of Mostar and finding a place to stay, we walked around the town–one of the most famous in the country–in an attempt to get a feel for it. We were amazed at the still-visible signs of the war; dozens of buildings, heavily damaged by direct hits of mortar shells and bombs, lined the streets. 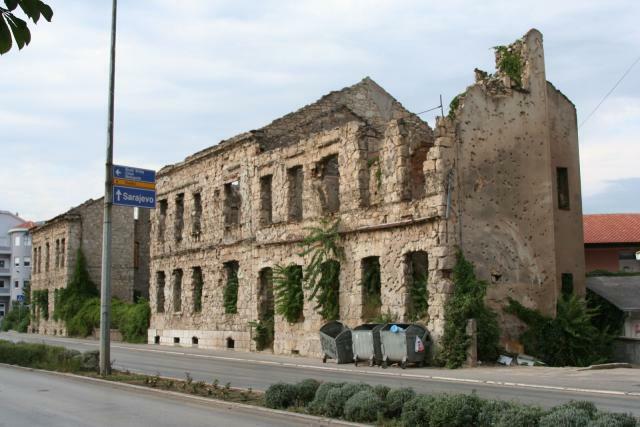 Unlike Croatia, where damage from the recent war has been mostly repaired, Bosnia has a long way to go. 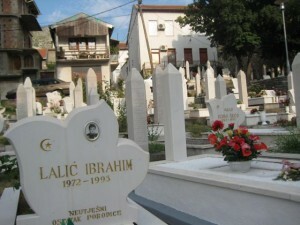 The wreckage was most evident on a street named “the Boulevard.” The Boulevard saw a great deal of fighting because one side of the street was occupied by the Croats and the other by Bosniak Muslims. Evidently, the fighting became so bad that, when someone was killed on the Boulevard, the body would sometimes remain there for months; it was too dangerous to try and retrieve the body for burial. Mostar has been famous for hundreds of years for its bridge, a stone arch masterpiece completed in 1557 (several years before the Rialto Bridge in Venice). However, the magnificent bridge and pride of the Bosniak Muslims was not spared during the war; the Croats blew it up in 1993. After the war ended in 1995, a decision was made to rebuild the bridge, leading to its triumphant re-opening in 2004 (interestingly, it took longer to build the bridge in the 20th century than it did in the 16th century). Now, the bridge is the town’s centerpiece, attracting tourists from all over the world (including two from the USA…). Keeping up a tradition that goes back centuries, young men donning speedos2 periodically jump from the top of the bridge into the icy river 75 feet below. 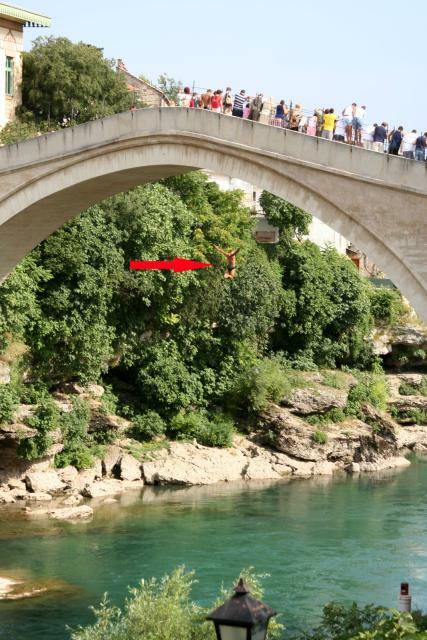 While this feat used to be done to impress girls, it’s now carried out to attract money from tourists (a jump usually brings in about $50). After leaving Mostar, we drove through the rugged mountain terrain of Bosnia to the capital city of Sarajevo, host of the 1984 Winter Olympics. During the Bosnia War, Sarajevo also incurred heavy damage. Most notably, the Bosnian National Library was targeted by the Serbs in a wicked attempt to erase the history of the Bosniak Muslims by destroying the thousands of books and archives housed in the library. We spent our short time in Sarajevo walking around the Turkish quarter of the city3 , visiting a cemetery where thousands of gravestones evidenced the widespread killings that occurred from 1991-95 and seeing the spot where a Bosnian Serb shot and killed Austrian Archduke Franz Ferdinand and his wife as they were driving in Sarajevo in 1914, sparking World War I. We ended our one night in the city at an outdoor summer concert called Pop-Rock-Live. We had hopes of seeing some of the good live music that we so dearly miss from our lives in Nashville. Instead, we heard a couple of terrifying heavy metal songs delivered at top volume by screaming teenagers. While we couldn’t understand the angst-ridden lyrics, we had a pretty good feeling that the band was expressing their anger at the recent horrific events endured by the Bosnian people. How could they not be? They were singing right in front of the bombed-out library.